This clever collapsible table is custom designed to hold all the elements of a vintage picnic. Grassy glades are perfect for picnicking, but definitely not ideal for keeping wine goblets and open bottles upright. 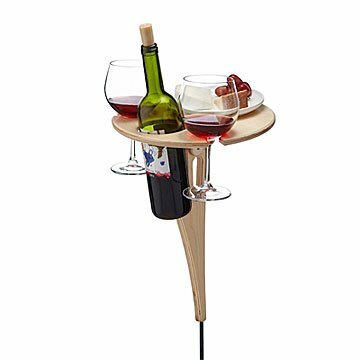 Michael and Ania Shepler's clever collapsible table is designed to hold all the elements of a classic picnic: two glasses, a wine bottle, and a plate full of your favorite pairings. The Baltic birch plywood design folds flat, locks in both open and closed positions, and incorporates two convenient handles. The fiberglass spike lets you plant the table securely in grass or sand, but isn't sharp enough to poke picnickers. Wine bottle, glasses, and plate not included. Handmade in Mechanicsburg, Pennsylvania. See easy setup instructions here. Easy to carry. Easy to set up. Easy to clean. Moved to a part of the country with great walks, great wine, and views of the ocean. This little table will allow us to enjoy evening sunsets in comfort. It folds beautifully and is light yet sturdy. A great idea! Very small & easy to tote. It is so cool and unusual. Very well made. Will be used mostly at outdoor concerts. Recipient was very excited to get it. The table is a gift for my parents who enjoy wine and are also RV people who travel. This product easily fits into their RV and yet is so simple and practical that it just makes sense for them to have it. The only thing I didn't like about it was that the finish was a little too rough for my taste, but my dad didn't have a problem with it and almost instantly figured out how the table propped up and is used. Tis is great for the beach. My sister-in-law loved this Christmas gift! Perfect for use outside. Now only wish there was an option for one with a beer bottle or beer glasses! Gave it a 4 star as I am not the one it's for and the giving date is a month away. From the other reviews it looks like a winner! Bought this for my daughter who loves by the beach. It works perfectly, including the little mob that holds the bottle securely. People always stop by to ask where I purchased it and I am happ to say UnCommon Goods. my daughter wasn't happy with me because she didn't want me spending the money oh well ! !